Philmac is looking for your best photo of your working dog at work, rest or play. 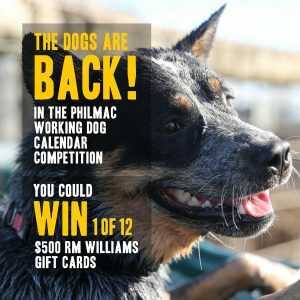 Winning entries will be included in the 2020 Philmac Australian Working Dog Calendar and will receive a $500 RM Williams GIFT CARD plus 10 calendars to share with friends and family! Upload a photo of your working dog (at work, rest or play) and include your dog’s name, breed and age, picture caption and your contact details. Image quality must be at least 5 megapixels.